Destiny, the famous shooter from developer Bungie, is about to receive its third DLC, called The Taken King. In anticipation of the new content, it was revealed information about the changes that the game will receive, which varies between collections of exotic items even more space to store weapons. Check out the main changes below. Currently in Destiny what defines the character of power is how much light your armor pieces have. From the date of launch of the new DLC (September 15), which set the light level of the players will be the average of all your attack and defense. With this, the weapons that the players equip will also be taken into account when calculating the level of light. So take your best arsenal for the battlefield! For those wondering what will happen to the current equipment that provide light, do not worry. When The King Taken launches, the defense value will be adjusted to the new standard taking into account how much light the item had. Along with the change of light mechanical play, there has also been an expansion of traditional levels of Destiny system. Now players will be able to reach level 40 through the traditional method: completing activities and bounties to gain experience. For new players who purchase the expansion, there will be an item that will allow your characters are automatically taken to level 25, allowing them to access the new content immediately. Additionally, for players that are currently above the 20 level, their armor will be recorded by the system. So when the update of the King of Possessed is released, the characters will be taken to the level proportional to its old equipment. From the release of The Taken King, several NPCs in the Tower will begin selling Ghosts with defense values. These will be accounted for in calculating the light level of the character. In addition, Ghosts also have special abilities like signal on the map where the player can find materials, in addition to extracting more when these findings. There may be more choices of skills, but these have not yet been revealed. Say goodbye to their brand of avant-garde and the crucible. As of September 15, there will be only legendary brands that will be used to buy equipment that previously required of predecessors, and has new uses as engrams buy or improve weapons. The old marks will be converted into Commendations, which can be used to gain reputation of avant-garde and the crucible. In an attempt to reduce the volume of items that the player must keep in your trunk, now there will be collections for badges, armor colors, ships and other equipment that do not alter in defense or attack values. In these collections, displays all the items already conquered (and may generate a copy for use), and those who have yet to be acquired. Along with this, they will also be introduced to new Exotic diagrams, as well as the collections, allow the players to recover exotic previously conquered. The diagrams also allow some specific items the first year of Destiny are improved, leaving them at the same level of The King of Owned equipment. 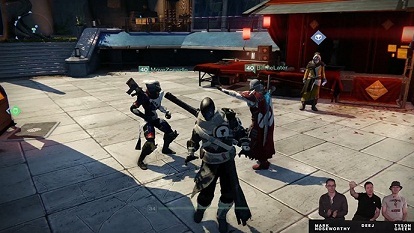 The Taken King arms will come with varying attack values, but if there is a weapon that the player likes and is not very powerful, you can resolve this situation. With the infusion of mechanical weapons the player can improve equipment through the sacrifice of more powerful items, you can then keep that feel you have good attributes, however that does not have a high attack value originally. Finally, one of the changes most requested by fans was met by the developer. Along with the release of The King of Possessed, the space in the trunk of weapons and armor of every player will be duplicated, arriving at a maximum of 72 items for each type. Now it's much easier to keep the collection that has been growing since the game's release.